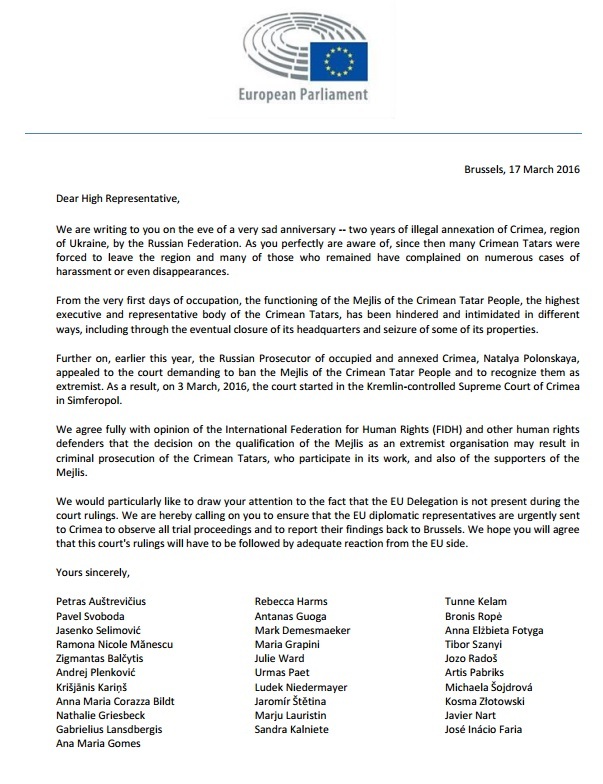 On 17 March 2016, 31 Members of the European Parliament (MEPs) from various political groups wrote to Federica Mogherini, High Representative of the European Union for Foreign Affairs and Security Policy, to ask her to mobilise the EU diplomatic service in support of the the Meijlis of the Crimean Tatar People. This body is the highest representative and executive body of the Crimean Tatars, a minority which has suffered particular harassment and discrimination since the annexation of Crimea by Russia two years ago. The MEPs asked Federica Mogherini to send EU diplomats to attend the Court rulings against the Meijlis, following the proceedings launched by a Russian prosecutor in order to classify the Meijlis as "extremist" and ban it because it has asserted that the annexion of Crimea to Russia was illegal. The letter to Federica Mogherini reiterates FIDH’s warning that classifying the Meijlis as an extremist organisation will lead to further prosecution of Crimean Tatars associated with or supporting its work.